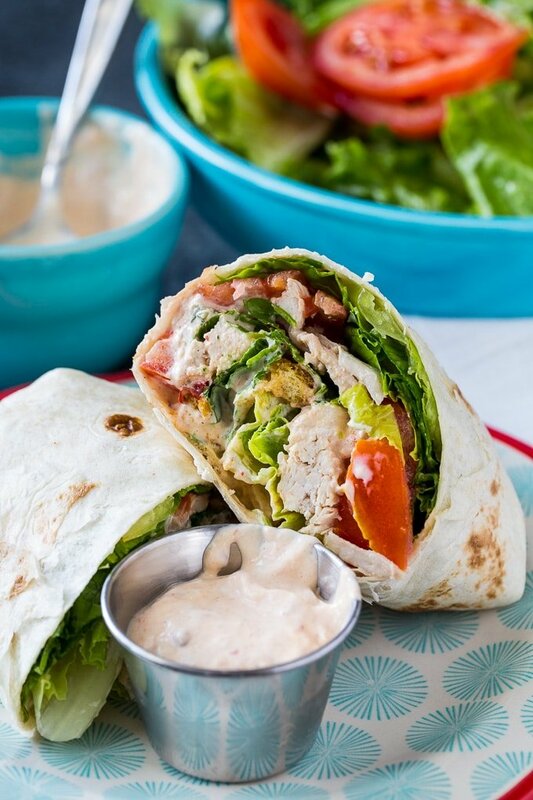 Spicy Chicken Caesar Salad Wraps are a delicious creamy, crunchy, and crispy lunch. They’re a breeze to make from precooked chicken. An easy and creamy homemade Caesar dressing gives these spicy wraps so much flavor. 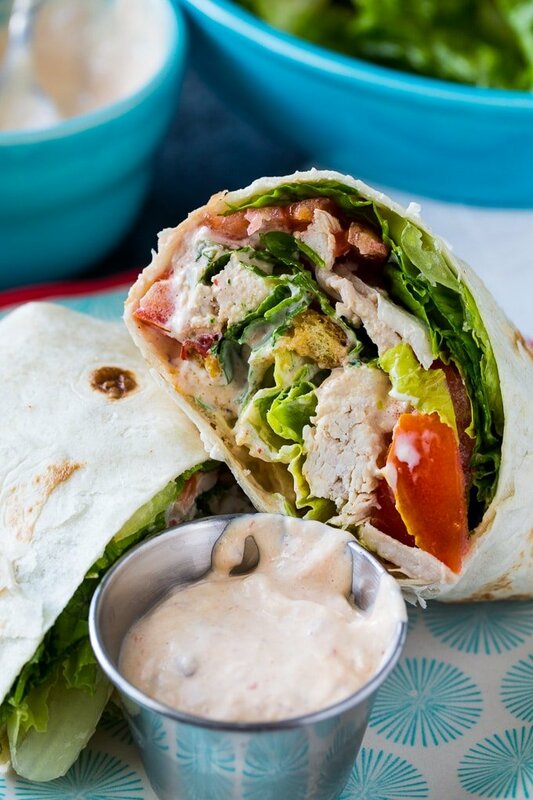 The homemade Caesar dressing is my favorite part of these Spicy Chicken Caesar Salad Wraps. It’s spiced up with some Chiptole peppers in adobo sauce. I love the smoky, spicy flavor that they have. The dressing also has a little fresh garlic flavor. Anchovies are a key ingredient in Caesar dressing. They add tons of salty flavor, but will not make the dressing taste fishy. This spicy wrap has so much crunch from chopped romaine lettuce and croutons. Using rotisserie chicken or leftover chicken makes these Spicy Chicken Caesar Salad Wraps so easy to prepare. They can be made ahead of time, but the croutons will lose some of their crunch. Make the Caesar dressing a day ahead of time for the best flavor. The flavors will blend and mellow a little. In a pinch, you could use a storebought dressing and add some chopped chipotle peppers to it. You can leave out the anchovies and add 1 teaspoon Worcestershire sauce if you wish. 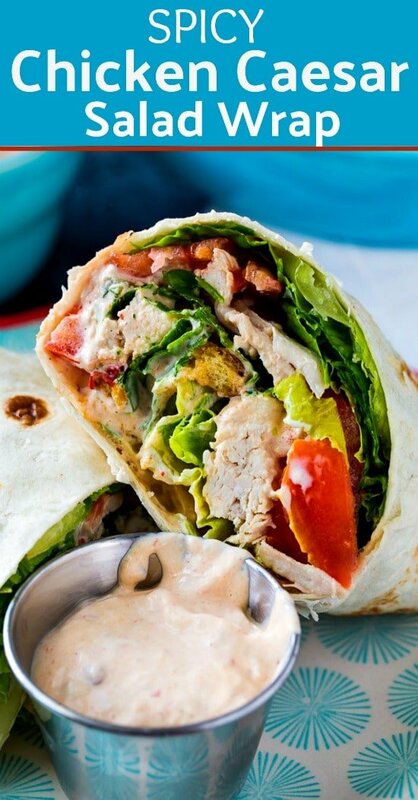 Spicy Chicken Caesar Salad Wraps are a delicious creamy, crunchy, and crispy lunch. They're a breeze to make from precooked chicken. 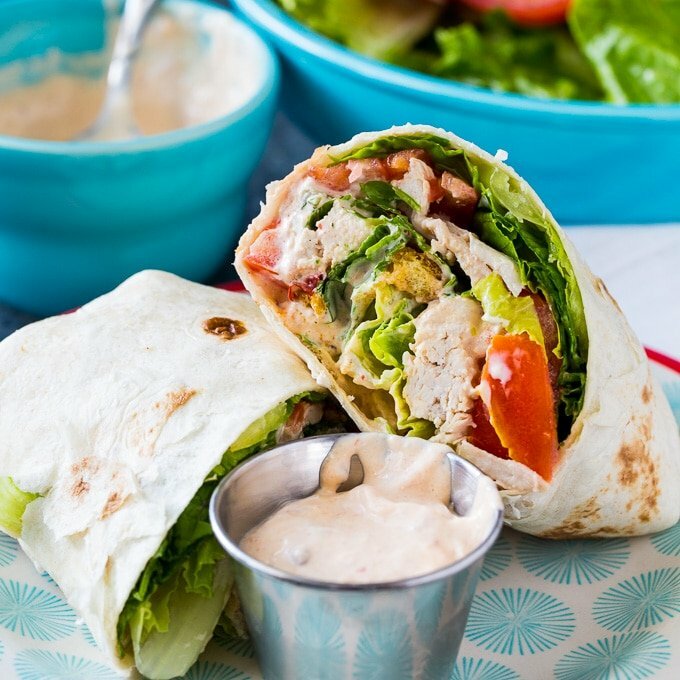 An easy and creamy homemade Caesar dressing gives these spicy wraps so much flavor. To make dressing, process all ingredients in a food processor or blender. Refrigerate until needed. Microwave the tortillas for 20 seconds covered with a damp paper towel to make them more pliable. Divide the ingredients between to 4 tortillas, making a mound in the center. Drizzle about 1 tablespoon of Caesar dressing over the ingredients for each one. Wrap up burrito style. Cut in half and serve. This entry was posted in Sandwiches and Wraps and tagged chicken. Bookmark the permalink. Greetings from Munich, Germany! Had the wraps tonight and they were delicious !